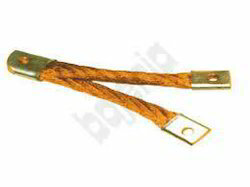 Our Copper Laminated Flexible Jumpers are made from Electrolytic Copper foils of 0.04 mm to 1.0 mm thick to suit flexibility as per customer’s application and requirements. We offer Flexible jumpers with contact areas HOT PRESS FUSION WELDED up to 400 mm wide. This process of hot press fusion welding is a very special process wherein the copper foils are welded together through Direct Current applied under pressure. By this process the foils get defused and become a homogeneous solid busbar at ends. This process has no influence on the conductivity between the welded contact areas and the flexible part of the connectors. It is also possible to drill, saw, or Mill the contact areas without any difficulty. leading manufacturer and exporter of following products.